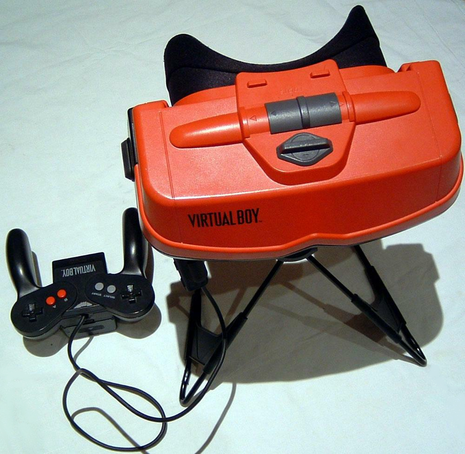 Nintendo's Virtual Boy (バーチャルボーイ, Bācharu Bōi (also known as the VR-32 during development) was the first portable game console capable of displaying "true 3D graphics" out of the box. 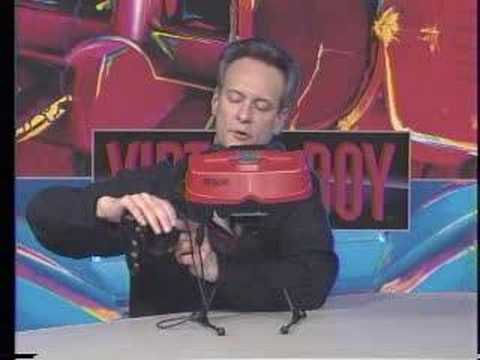 Most video games are forced to use monocular cues to achieve the illusion of three dimensions on a two-dimensional screen, but the Virtual Boy was able to create a more accurate illusion of depth through the effect known as parallax. In a manner similar to using a head-mounted display, the user looks into an eyepiece made of neoprene on the front of the machine, and then an eyeglass-style projector allows viewing of the monochromatic (in this case, red) image. It was released on July 21, 1995 in Japan and August 14, 1995 in North America at a price of around US$180. It met with a lukewarm reception that was unaffected by continued price drops. Nintendo discontinued it the following year. The Virtual Boy (VB) system uses a pair of 1×224 linear arrays (one per eye) and rapidly scans the array across the eye's field of view using flat oscillating mirrors. These mirrors vibrate back and forth at a very high speed, thus the mechanical humming noise from inside the unit. Each VB game cartridge has a yes/no option to automatically pause every 15–30 minutes so that the player may take a break. In addition to playing with the stand attached, one could also place the VB device on their forehead while lying down for an easier mode of game use. The controller itself is shaped like an "M" (similar to a Nintendo 64 controller and GameCube controller). One holds onto either side of the controller and the part that dips down in the middle contains the battery pack. There are six buttons on the controller (A, B, Start, Select, L and R), the two D-pads, and the system's "on/off" switch. The two directional pads are located on either side of the controller at the top. The "A" and "B" buttons are located below the pad on the right side and the "Start" and "Select" buttons are located in the same spot on the left side. What would normally be called "shoulder buttons" ("L" and "R") are located behind the area where the pads are, on the back of the controller, functioning more as triggers.